A former Principal dancer with the San Francisco Ballet, Mr. Lopez has had roles created for him by choreographers Michael Smuin, William Christensen, Kirk Peterson, John Clifford, Jiri Kylian, and Victoria Morgan. His repertoire includes the works of Jerome Robbins, Balanchine, and Arthur Mitchell. He received an Emmy for his work in Michael Smuin’s A Song For Dead Warriors, and toured in Andrew Lloyd Weber’s Phantom of the Opera. Mr. Lopez’ repertoire includes leads in The Nutcracker, Cinderella, In the Night, Forgotten Land, Bolero, Spartacus, Don Juan, and Beauty and the Beast. 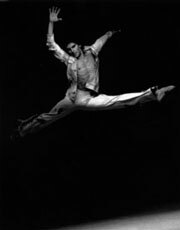 He has created a new ballets for National Ballet de Mexico and Westside Ballet, and had projects with New Mexico Ballet. Mr. Lopez has delighted audiences with his annual portrayal of Dr Drosselmeyer in Westside Ballet’s Nutcracker, as well as his exceptional comedic performance as The General in David Lichine’s Graduation Ballet with Westside Ballet in 2014. Mr. Lopez primarily teaches adults at Westside School of Ballet.